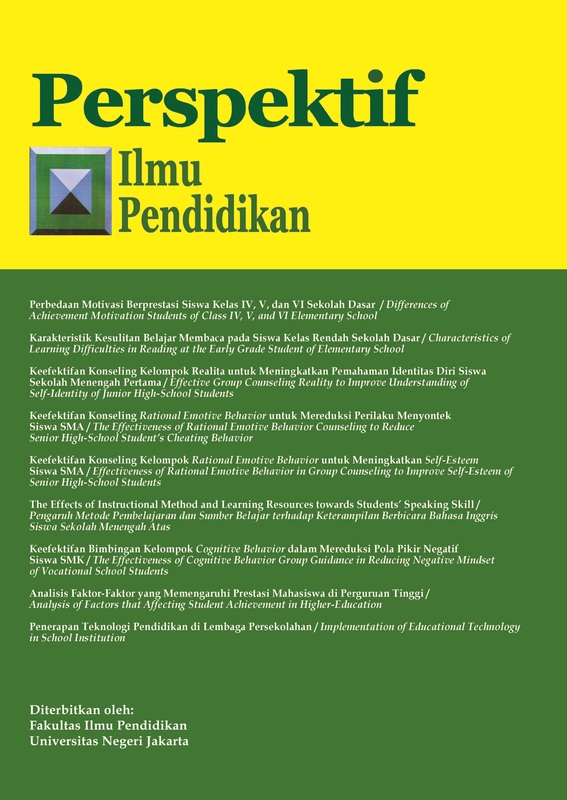 Educational technology as applied science that changes the definition over time makes the study area and contribution of Educational Technology in the education system at Indonesia also changed. This study is to identify the implementation of Educational Technology areas that have been applied in school institutions at elementary school, so in the future undergraduate researchers can do further research. This study is a descriptive research and has a survey method. The purpose of this study is identifying the implementation of Educational Technology areas that have been applied in elementary school institutions consisting of the area of creating, using, managing and evaluation. This study conducted at SDN Tegal Alur 09 From August to October 2017. To collect the data, this study used a questionnaire sheet, an interview sheet, and documentation. The result of this study has two types data, first, in quantitave data all of Educational Technology areas have been applied in school institution, but only three areas, which get a very good score, meanwhile creating the area get a low score. Second, in descriptive analysis data, there are some indicators of creating the area that haven’t been applied yet, but on the other hand, some indicators in all of areas that have been applied still in the simple and restricted form. Based on the result, educational technology as the study and ethical practice to facilitate learning needs to be introduced closer to the school institutions, because school institution still doesn’t know the existence of educational technology and its areas. Arikunto, S. (2006). Prosedur penelitian suatu pendekatan praktik edisi revisi V. Jakarta: Rineka Cipta. Januszweski, A., & Michael, M. (2008). Educational technology: A definition with commentary. New York: Lawrence Erlbaum Association. Khoirunnisa, R. (2016). Pemanfaataan media pembelajaran montessori dalam pembelajaran pembendaharaan kata di Sekolah Bulan Bintang Islamic Montessori Preschool. Skripsi tidak diterbitkan. Jakarta: Universitas Negeri Jakarta. Miarso, Y. (2004). Menyemai benih teknologi pendidikan. Jakarta: Pustekkom bekerjasama dengan Kencana. Rosfita, I. (2017). Penerapan metode pembelajaran karyawisata pada mata pelajaran sejarah bagi siswa SMPHomeschooling Prigama Jakarta. Skripsi tidak diterbitkan. Jakarta: Universitas Negeri Jakarta. Seels, B.B., & Rita, C. R. (1994). Teknologi pembelajaran definisi dan kawasannya (terjemahan). Jakarta: Universitas Negeri Jakarta. Selywn, N. (2011) . Educational and technology: Key issues and debates. London & New York: Continuum. Undang-Undang Dasar Nomor 20 Tahun 2003 tentang sistem pendidikan nasional. Warsita, B. (2008). Teknologi pembelajaran landasan & aplikasinya. Jakarta: Rineka Cipta.